Add Cast Lighting Fixtures to the image - check out how to add effects! NORRISTOWN, Pa. - Oct. 3, 2018 - PRLog -- Landscape Design Imaging Software, Inc. has added Cast Lighting fixtures to the Landscape Lighting Software program as well as the GreenScapes Landscape Design program. Our programs help outdoor contractors and home builders show clients their landscape designs ideas with photo realistic imaging. Cast Lighting products can now be utilized through downloadinginto the program. Cast Corporate Headquarters is located in Hawthorne, New Jersey with distributors throughout the United States and Internationally. Cast Lighting builds solid bronze fixtures, which blends beautifully with any outdoor design. They are also used commercially and residential. Their fixtures include deck, path, wash, directional, tree and well lights. The fixtures themselves are accessed through the imaging portion of the programs. 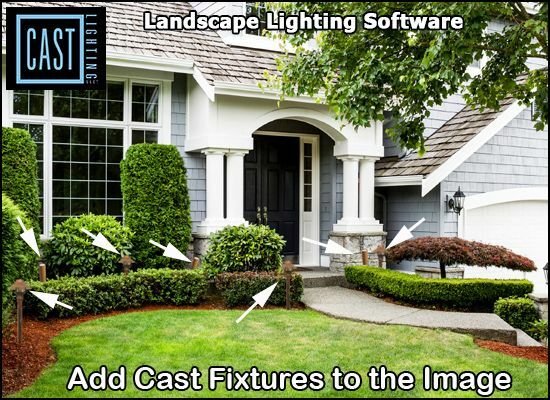 In the Landscape Lighting Software program the background image is uploaded and the Cast Lighting fixtures are placed where they would we installed, making this a very easy way to show clients. The Lighting Effects program allows you to show the potential client how the light from the Cast Lighting fixture will be projected at night. You can also adjust the shades of darkness showing early evening to way into the night. The programs are exclusively designed for landscapers, outdoor lighting contractors and other professionals who want to show the spaces illuminated. The end result is a design that gives the homeowner or business owner a clear idea of what they are paying for, turning a potential client into a customer.